Watford’s Gomes crowned most valuable keeper in the Premier League! Super Saver Awards: Watford’s Gomes crowned most valuable keeper in the Premier League! Hello, it’s me, Bob Friendly. 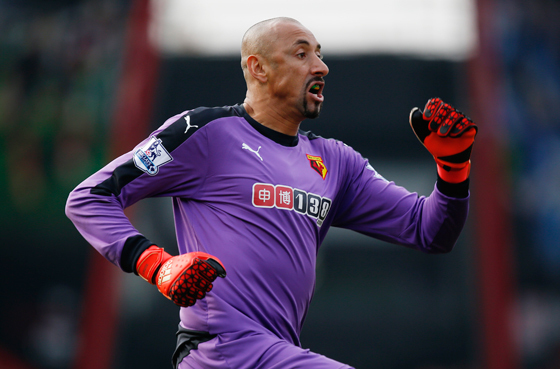 I am delighted to announce that Watford’s goalkeeper Heurelho Gomes has won the annual Scottish Friendly Super Saver Award. As a savings and investment provider, Scottish Friendly is keen on the performance of football’s best savers. The hard work keepers put into saving under great pressure can be held up as example to us all. But it’s not just all about how many shots you save! We’ve delved a little deeper than that. Our highly prized Super Saver algorithm uncovers the goalies that have proven their ‘net’ worth to their clubs. Winners will have not only made beautiful saves this season, but will have also been the most cost-effective for their teams. Gomes has made a save made every 26.93 minutes of game-time at a cost of £6,142 a save, which makes the keeper a stunning 82 per cent more cost-effective than others in the League. Last year we awarded Burnley’s Tom Heaton with this accolade. He made a save every 26 minutes of game-time, and each cost his club just £6,000 per save, which was 93 per cent more cost-effective than other keepers! We’ve recreated one of Gomes’s best saves here, but to have a closer look at the statistics and see our table of the best value goalkeepers in the 2015/16 Premier League season, click here. Our annual Best Save of the Season Award goes to Manchester City’s Joe Hart, and this just goes on how much we were awed by this particular save, which we’ve recreated with our Subbuteo set! Watch it here. To celebrate their win, we’ve recreated one of Hugo Lloris’s best saves! Watch it here. Phew! Until next time folks, keep saving!